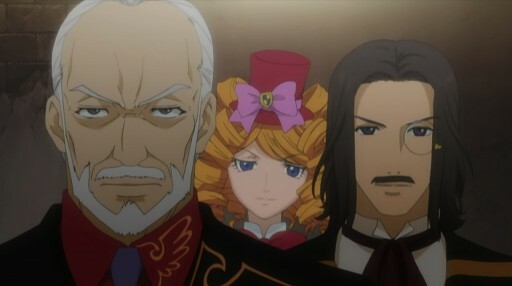 We are finally back to the Rokkenjima of 1986 in episode IV-IV of Umineko no Naku Koro ni, “problem child”, where Kinzo supposedly participates in the family meeting. The time is now 10:10PM. 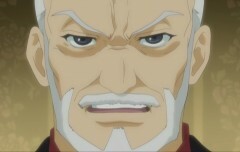 While some of the parents are surprised at how hale and hearty he is, with particular focus on the surprised Eva and Rudolf, Kinzo is disappointed that no one has solved the mystery of the inscription so far and decides to cancel his little game of choosing the next family head based on who solves it first. In fact, he decides no one will be inheriting the wealth and family headship, not even Krauss. With some persuasion from Nanjo, Kinzo does relent his stance a bit and decides to give the grandchildren the chance to inherit the wealth and family headship. Before anything else can start, however, Kinzo needs something to be done and reveals what is supposedly the real purpose for the family meeting: the gathered relatives are to be used as sacrifices according to the ritual in the inscription. 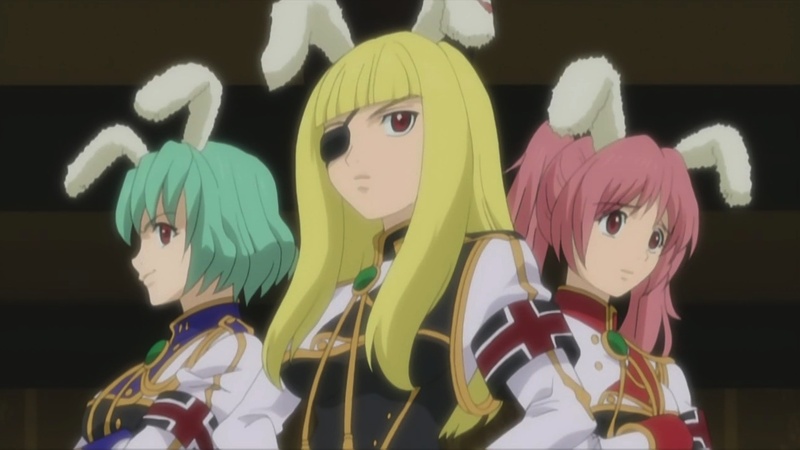 With that, Kinzo summons the personal guard of Pendragon, Siesta 45, Siesta 410, and Siesta 00. While the other people in the room are confused about what is happening, Kinzo orders the Siesta sisters to kill six people at random according to the first twilight of the inscription, which quickly turns into a panicked mayhem people start dying. Natsuhi, Hideyoshi, Rudolf, Genji, Eva, and Rosa are killed. The last at least tried to attack Kinzo in response to the killings, but she is personally killed by Siesta 00. With the first twilight fulfilled, Kinzo summons Ronove and Vergilia. He also summons one of the 72 demons, Gaap, and has her imprison the remaining people in the room. Interestingly, she refers to Kinzo as the great summoner Lord Goldsmith. With a snap of Gaap’s fingers, Nanjo, Kyrie, and Krauss are swallowed up by a blackness on the floor, and the next ones to be swallowed up are Kanon and Shannon. On the other hand, Gohda and Kumasawa escape the room, and Kinzo just let’s them escape as there is no way to escape the island itself. In the meta world, meta-Battler is exasperated yet again at Beatrice’s bad taste and finds nothing worthwhile from the previous scenes given how we can’t believe anything we see. On the other hand, Ange considers it the ideal case of how people were killed among the cases so far, for unspecified reasons (which makes me wonder when she had the time to get familiar with the previous cases, unless she already knew the contents of the message bottles, which is not at all an unreasonable assumption). Beatrice just encourages meta-Battler to make his declarations, which she looks forward to crushing in the end with her red truth. The scene now changes to something completely different. We are seeing the past right after Rosa broke Sakutaro and with Maria wailing. When Rosa exclaims that Maria should make human friends instead of doll friends and tries to hit her again, Rosa’s hand shatters like glass with a look from Maria. The scene then changes from their house into the meta world where Beatrice also shows up, and Maria unloads her grievances against Rosa, quite unlike the facade shown to Ange. This in turn provokes Rosa to vent her own frustrations. This does not end well: Maria uses magic to break open Rosa’s neck, inspired by how Rosa broke open Sakutaro’s neck. 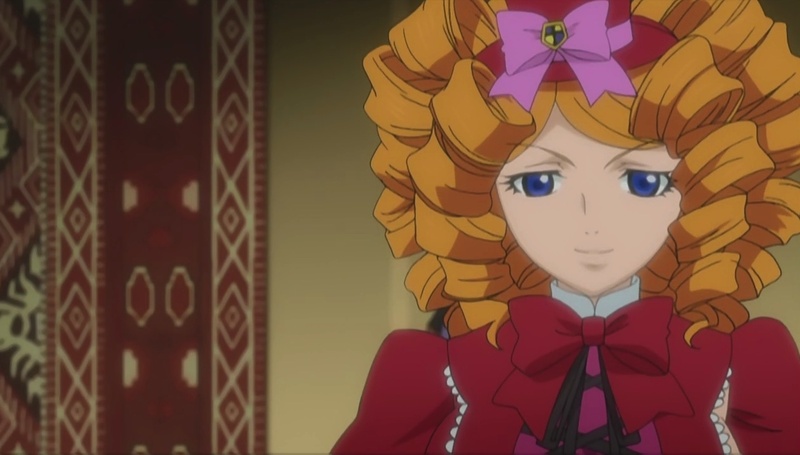 Just killing Rosa once isn’t enough to satisfy Maria, so Beatrice revives Rosa for her. The revived Rosa just goes on with her own rant, hating Maria whose existence scared off any man she wanted to be with, even wanting Maria not to have been born in the first place. This time, Maria knocks off Rosa’s head herself without magic. The time is now 10:24PM. Maria has killed Rosa over a hundred times with Beatrice’s help, and she is quite enjoying herself. Beatrice then congratulates Maria for getting a foot into the true world of witches. 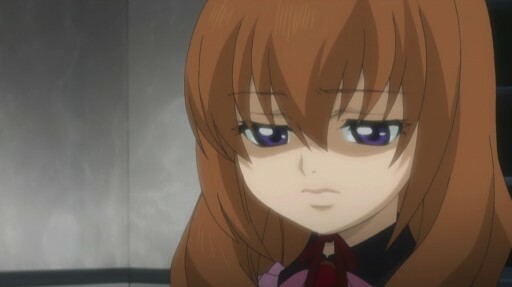 Maria isn’t particular happy, though, because she’s sad that she still cannot revive Sakutaro, with his creator denying him. This soon brings up the analogy to herself and Rosa, with how she thinks her mother is not accepting Maria. But after the brief sad moment, Maria just perks up again in that creepy way of hers. We’re now back to the Rokkenjima of 1986 at the guest house where Maria is just waking up. Maria starts whining with a little teasing from Battler, but with a touch from George, she calms down immediately and then starts laughing in that creepy way of hers while claiming she’s a witch. Presumably the previous scenes with Maria and Rosa were from a dream of hers, and Maria must have been enjoying it way too much. A panicked knocking then starts at the door, and it turns out to be terrified Gohda and Kumasawa when opened. Elsewhere, Krauss, Kyrie, Shannon, Kanon, and Nanjo are imprisoned in some sort of underground dungeon. Oddly enough, there is a connected phone in their cell, but it’s not connected to the outside as they learn when trying to contact the police. It is only an internal line, and Krauss manages to contact the room with the grandchildren, with Jessica being the one to receive the call. They’ve heard what had happened from Gohda and Kumasawa by now, and Krauss’ primary concern is their safety, and he tells them to stay put. With nothing to do during imprisonment, Shannon muses to Kanon that it would be nice if they could reach the golden land this time. Kanon is entirely skeptical whether the golden land even exists, but Shannon is quite certain that it does, claiming to have been there for just a brief moment. This is when Kinzo arrives with Ronove, Vergilia, and Gaap, and it is revealed that they are in the underground of the Quadorian, the hidden mansion. Kinzo also reveals that he plans to use the prisoners as the sacrifices for the subsequent twilights of the inscription. It also turns out that Kinzo had indeed left the phone in the cell deliberately, and the episode ends with him forcing Krauss to make a call to the grandchildren. Kinzo summoned six entities, when it looks like only three could have done everything that was shown. Ronove and Vergilia were just onlookers, and I’m not quite sure if the addition of Siesta 00 made the Siesta sisters work any differently. Anyways, there are also six victims required by the first twilight. Is this a hint that there are six unknown people on Rokkenjima? If six people were already killed, any red text claiming that there are not more than nineteen people would be true. I predict that the next person to die will be either Gohda or Kumasawa, who will be killed right after Shannon and Kanon are killed. This would fulfill the second twilight and fourth twilight while leaving five people free, so that the remaining five people would not have to worry about being killed for any of the other twilights and instead can focus on solving the inscription. At least this might be what Kinzo is planning (I don’t think paranoia would go away despite assurances to the contrary), and it might be this point that Ange thought was ideal. This may be the first arc where George did not get the chance to propose to Shannon. The reason why Ange said it was the perfect killing method was because the people were definitely dead while at the same time still being identifiable. This makes it hard for Battler to claim that one or more of the victims was just playing dead or using a fake body and therefor he has less chances to force Beatrice into using red (Beato actually admits the truth of this theory in the VN at this point). But there was supposed to be tons of speculating going on concerning falling from the dining room right into a dungeon. There was supposed to be a talk of drugs and whatnot.